Ruby Toenjes, 95, died Thursday, August 17, 2017, at the Monticello Nursing and Rehabilitation Center, following an extended illness. Funeral services were held 11 a.m., Monday, August 21, 2017, at the Goettsch Funeral Home, Monticello, with interment in the Oakwood Cemetery. Friends called from 3 p.m. until 6 p.m. Sunday at the Goettsch Funeral Home. Allan R. Christopherson officiated at the services. Surviving are two children, Sandra (David) Brandt of Seattle, Washington, and Douglas (Jan) Toenjes of Monticello; three grandson, Ryan Toenjes, Todd and Cameron Brandt; five great-grandchildren; and a sister, Mildred Brewer. She was preceded in death by her parents; her husband, Irvin and six siblings, Laverne Ambuehl, Erma Eby, Iola Hoffman, Edna Rebitch, Patricia Rhatigan and her twin sister, Joyce Robertson. Ruby Ann Ambuehl was born February 28, 1922, at the John McDonald Hospital, Monticello. She was the daughter of Andrew and Lena (Etten) Ambuehl. Ruby attended Lovell Township School #1 and the Monticello Community High School. Ruby Ambuehl and Irvin Toenjes were married January 10, 1940, at the German Reform Church Parsonage in Monticello. The couple farmed in Wayne Township near Anamosa. In 1967, the couple retired from farming and moved to Anamosa. Ruby worked at the Anamosa Hospital in the medical records department, as a nurse’s aide and in the Senior Day Care. 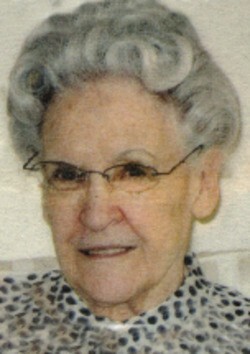 Irvin preceded her in death on October 16, 2005.